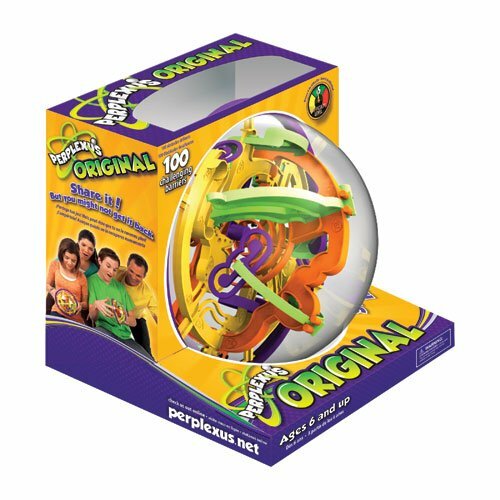 The Perplexus is the current generation of a puzzle created by Michael McGinnis, and originally released to the public as SuperPlexus. Perplexus is available from a number of locations such as Amazon, and Puzzle Master and many other toy shops for less than $20. 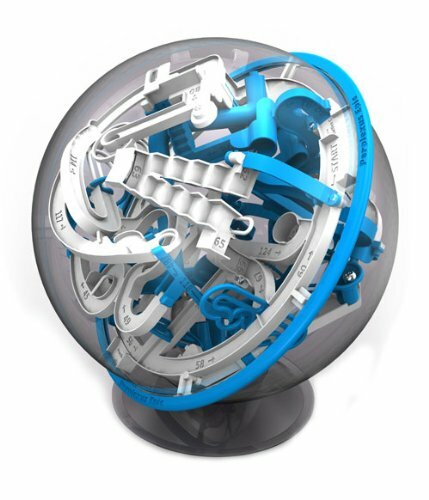 The purpose of the puzzle is to guide the ball bearing along the tracks moving from each 'checkpoint' from 1-100 in sequence by rotating the sphere. 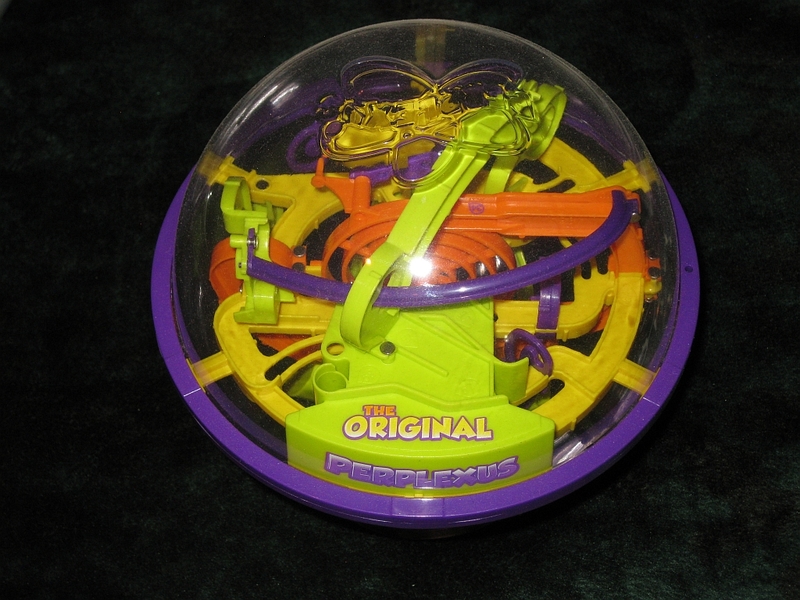 The original Superplexus had both sound and a timer mechanism to allow you to compete for the fastest time, however in the current version, the electronics which were rather loud an obnoxious, have been removed in favour of a simpler quieter version, where the only sound is the ball falling off the maze, and bouncing on the bottom of the perspex shell, which will happen frequently. There's even a small stand supplied with the puzzle to stop it rolling away when you eventually put it down. When you start playing with the puzzle, it all seems fairly simple. The path is easy enough to follow, and moving from one 'checkpoint' to the next is fairly straightforward. Then you hit a certain transition, where it seems all to easy for the ball to fall off and force you to go back to the start. Despite that, it never seems frustrating, and you keep going back to try to make it all the way from 1-100. As a nice design feature, there are three start points in the puzzle, allowing you to restart from 1/3 and 2/3 of the way through so you can practice each section. The real challenge though is the full run in one shot. There are some very clever sections in the puzzle, such as the cup you drop the ball into then need to swing from one side to the other before tipping the ball back out onto the next track to continue. Overall it's well thought out, and I am sure went through many iterations before finally becoming the puzzle that it is today. Michael McGinnis was a 3D design teacher and came up with the idea for perplexus as a toy in the late 1970's however it took him over 20 years to bring the idea to the market as it is today. He has also created super sized versions of the puzzle from wood and I highly recommend checking out his website for the pictures, and some of the story behind the creation of these huge puzzles. ( http://www.santarosa.edu/~mmcginni/superplexus/) While too big and heavy to hold in your hands, they run on rails allowing you to freely spin the sphere. I have no doubt that this added restriction adds an extra challenge to the puzzle. With the launch of two new Perplexus puzzles set for May 6th 2011, the Rookie, which should be a simpler version of the original, designed for younger children, and the harder 'Epic' Perplexus coming in a very slick icy blue and white colour scheme and 125 checkpoints to navigate, there is a lot to look forward to in the series. I'd certainly recommend the original, and once I pick up the Epic, I'll be sure to pass on my thoughts. The Perplexus puzzle in the box. 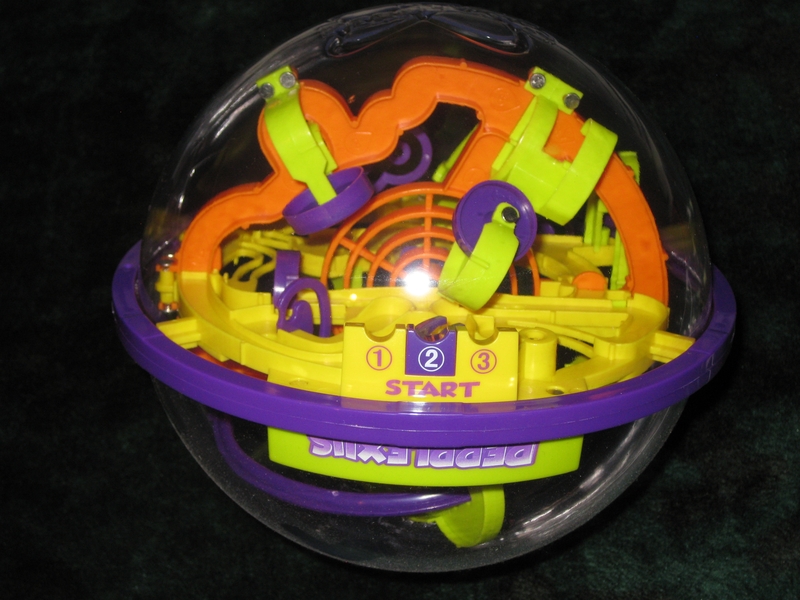 The Perplexus is a fun dexterity puzzle, which seems to be marketed more toward a younger audience with its bright colours and the pictures of a children playing with the puzzle while the parents watch on from behind on the box, however I can assure you that this puzzle will keep the whole family amused as they try to navigate the ball through the maze. Leave this one sitting on the table, and you can be sure people will want to pick it and play, and before you know it they'll be off to buy one for themselves.